South of the souk on the way to the Castle of St. Louis, is the Great Mosque, formerly the Church of St. John of the Hospitalers. The four walls of this rectangular building (recently restored to their natural beauty) date to the 13th century. 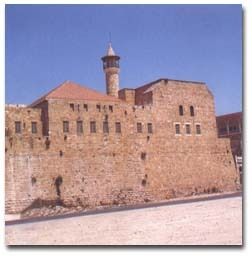 Originally fortress-like Crusader compound with its own chapel, it is still an imposing structure, especially viewed from the seaside.